Will the Bear Market End the “War on Drugs”? Will the Bear Market End the "War on Drugs"? In 1996 California voters approved Proposition 215, which extended legal protection to doctors who recommend and patients who use marijuana for medical reasons. This inspired the "medical marijuana" movement, though it made only sporadic progress in the decade that followed. Beyond a few mostly Western states, the movement found meager legislative support. Until around 2007, that is. In 2007 and 2008, legislatures in 27 states considered bills related to marijuana — each one sought to relax or eliminate the current penalties for use and/or possession in those states. The trend continued into 2009 and 2010. This past March saw the most far-reaching legislative proposal yet, again in California: the state legislature will vote on a bill to allow adults over 21 to personally possess and cultivate marijuana. It would also implement a regulatory regime that taxes pot sales by licensed vendors. The trend itself may not be news to you, even if you don’t know all the particulars. This past January, an ABC News/Washington Post survey found that 81% of Americans support the legalization of medical marijuana (up from 69% in 1997). The same survey found 46% support "legalizing small amounts of marijuana for personal use" (up from 22% in 1997). 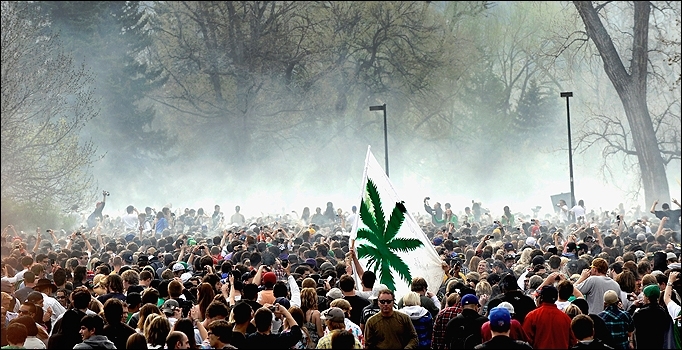 Still, you may not have gotten the memo about this past Tuesday (April 20) and the event known as 4/20, aka "Pot Day." Participants made a public show indeed of how much this day means to them: behold the crowd gathered for the occasion on the campus of the University of Colorado. Yes, that cloud is exactly what you think it is.